Vegeta is a special blend of the finest vegetables, herbs and select natural ingredients that’s been the European chef’s secret for over 50 years. The secret? You can add it to any of your dishes to intensify the delicious taste! Whether you’re sprinkling it into your favourite stews and meats, or adding it to pasta, rice and soups, you’ll love the difference Vegeta makes! Before preparing meat or fish, sprinkle both sides generously with Vegeta. For cooked and stewed dishes (soups, sauces, rice, vegetables, etc.) add Vegeta 5 minutes before finishing. 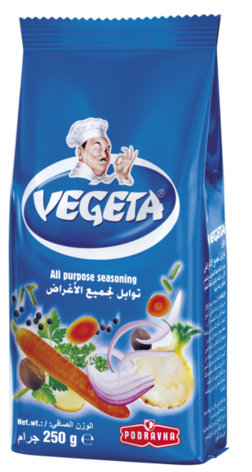 One spoon of Vegeta (3 g) is recommended per 250 ml (1 serving).